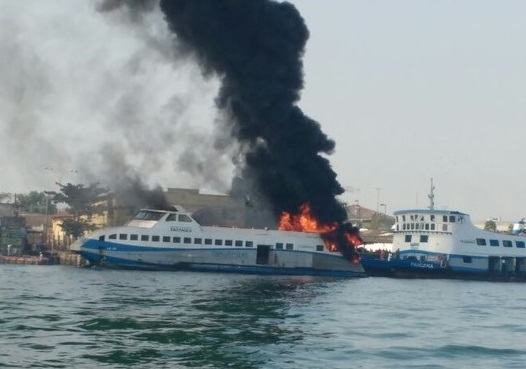 The Brazilian catamaran speed ferry LS-01 caught fire at dock in Vicente de Carvalho, Brazil. The vessel was under maintenance works, when the engine room and part of the accommodation inflamed in terrible fire. The local authorities and Fire Department were informed about the accident and at the scene of the fire were dispatched several firefighting teams and harbor tugs. After less than 2 hours the flames were put under control and the fire was completely extinguished, but ferry was severely damaged. The company operator will assess the damages, but confirmed that there were no injured people and ferry had no one on board during the fire. Before the arrival of firefighters, the dockworkers tried to extinguish the flames with fire extinguishers, but without success. The fire was battled by sea with assistance of harbor tugs and by land from the firefighters. The local authorities started investigation for the root cause of the fire. During the accident there were no injured people and no water pollution. The catamaran speed ferry LS-01 is serving the line Santos – Vicente de Carvalho, Guaruja with capacity of 350 passengers. The vessel is owned and operated by the Brazilian company Dersa. Mexican Biggest Oil Company, PEMEX, is already being robbed by pirates in boats.